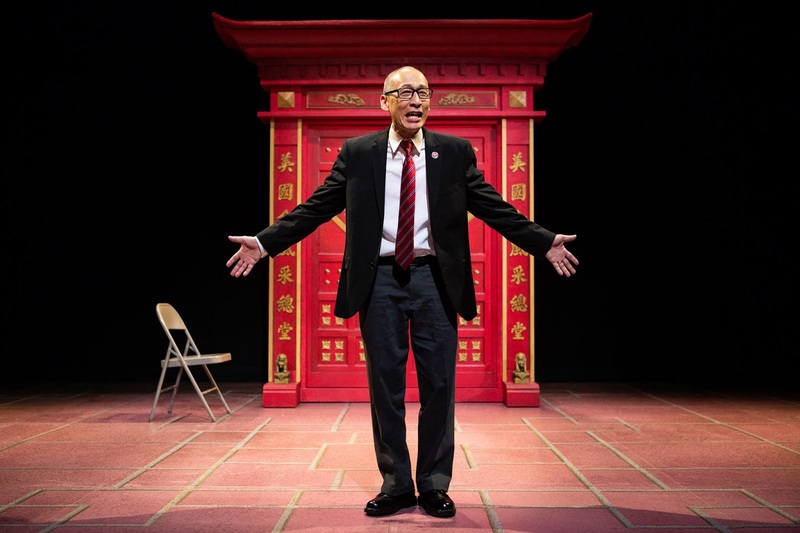 Theatre Eddys: "King of the Yees"
But the “two-hander” play that Lauren Yee thinks she has written and is now in its opening minutes at San Francisco Playhouse (with one actor playing her and another her father, Larry) is not the play that is destined to be performed here tonight. 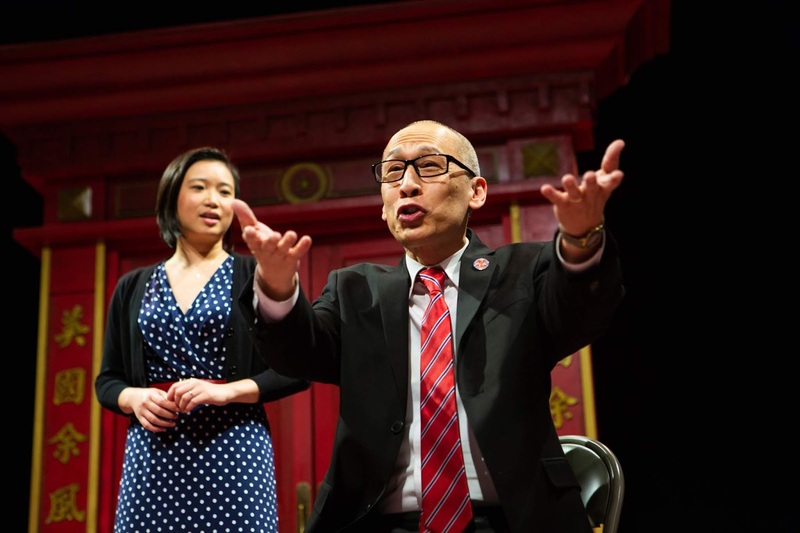 And while truth and truths may abound, the things that will fall apart will be some of the playwright’s own perceptions about Chinatown, her dad, and most of all, herself. And thus begins a wild and wooly two hours of Lauren Yee’s “true story” entitled King of the Yees, a rollercoaster-ride adventure now at San Francisco Playhouse where the fourth wall quickly collapses, where plot lines are few but not missed, where stories of San Francisco politics and personalities abound, and where reality gives way to fantastical forays into worlds that make Beach Blanket Babylon seem tame in comparison. 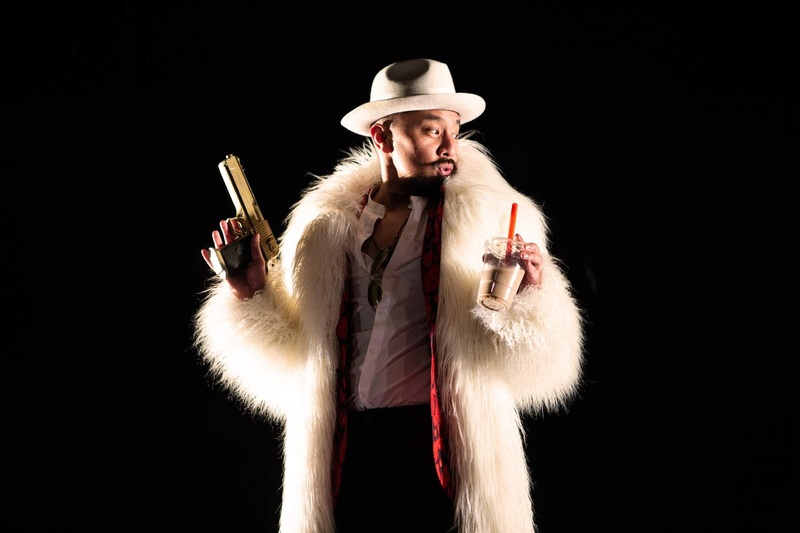 Beyond a script that pulls more surprises out of the hat than a Vaudeville magician with his suddenly appearing rabbit, a big reason that the San Francisco Playhouse production of King of the Yees is a bundle of laughs is the actor who is reprising his role of Larry Yee from three, other recent runs. 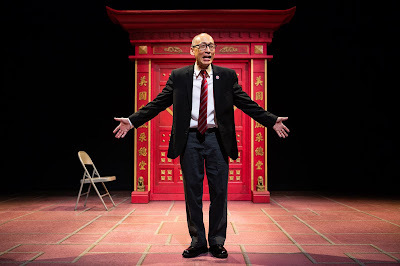 As Larry Yee who is ready to celebrate this very evening his sixtieth birthday, San Francisco’s own Francis Jue is overflowing with spry and spit, full of funny asides that to him are serious-enough observations but always provided with twinkles in his eyes. In one seemingly spontaneous response, he points matter-of-factly to “them, the Jews” in the audience when asked for whom his daughter has written her play (bringing howls from the audience). Later, he names all of us as ‘honorary Yees,” starting a back-and-forth argument with his daughter (“They’re not Yees [she]... They’re all Yees [he] ... “They’re all white” [she]). As Lauren (an impatiently patient Krystle Piamonte) keeps trying to push him off the stage, he sits in a chair mid-stage and says, “Don’t worry, boss, you won’t even see me ... it’ll be like I’m not here.” But here he is, and we as audience could not be more delighted that we do see a lot of him. Clearly, both Francis Jue and his “king of the Yees” reign supreme on this stage. 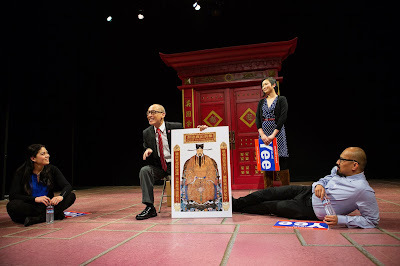 Even the two interrupted actors (Actor 1 and Actor 2) are fascinated as they continue to question the always-in-motion, old-but-really-young-acting Mr. Yee (“but just call me Larry”) about his life (FBI agent or telephone man? ); his passions (being a “sign guy” for Senator Leland Yee’s latest campaign for Attorney General); and about “the model ancestor.” That last reference is to the ancient Yee who is so important for all Yees to remember in order to understand what is true in life. As the female actor (who was playing Lauren before the real Lauren appeared) heads out to feed her parking meter (one of many San Francisco whims and woes that keep popping up in the popcorn-like script), another actor emerges from the audience at the invite of Larry. Actor 3 in his big, round eyeglasses is all gaga over Larry’s stories, screaming with excitement like a kid full of awe and wonder, no matter what this chattering man happens to say next. As the evening continues to splinter into segments and stories galore, these three actors will return in the likes of a jolly, dancing Chinese lion; an acupuncture-practicing chiropractor with foot-long, white beard; and a notorious Chinatown criminal in a floor-length white mink named Shrimp Boy who is toting a big gun and a bigger mouth. Shrimp Boy (Jomar Tagatac) will bring the house down as he mimics his mother yelling in a loud, froggy voice “RAYMOND” at him because he will not regularly come see her, never mind he was in prison at the time (“with my good friend, Charles Mansion”). The good times continue rock and roll on the stage until Larry suddenly disappears, drawn into some dark purgatory after entering the large red doors that have dominated the other wise vacant stage. 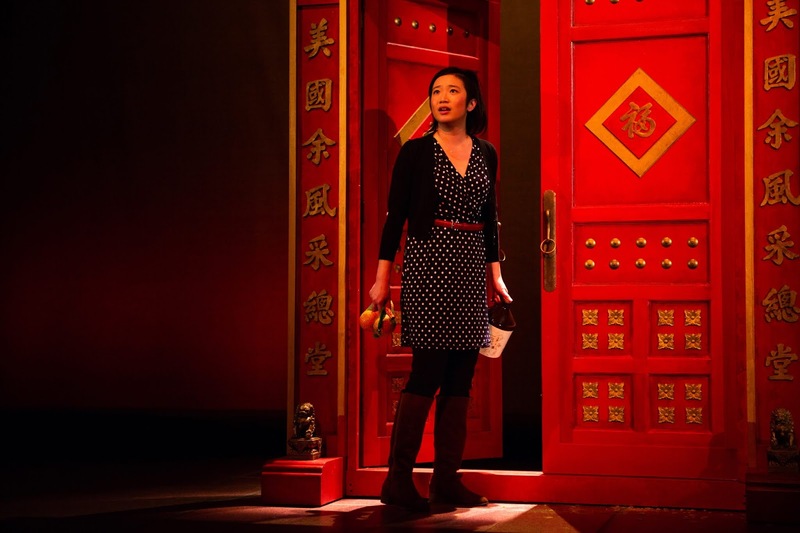 Designed by set designer Bill English, we are told upfront that the doors stand on “Waverly Place, wedged between Stockton and Grant, Clay and Sacramento” in San Francisco’s Chinatown. The stand-alone doors -- doors that can only be entered by a true Yee -- take on a life of their own, at one point literally moving around the stage, surreptitiously following an unsuspecting Lauren. When Lauren seeks to find her dad, she discovers no amount of “open sesame” or “alikazaam” will work for her to open these mammoth doors. 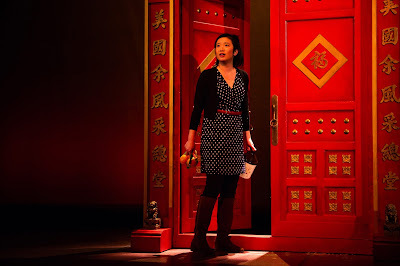 After careful to act as the ‘adult’ on the stage in the first half as she tries to steer her dad out of her play so the actor playing him can resume her script, Lauren in the second act heads out on an odyssey through Chinatown to find her dad, with Krystle Piamonte showing whole new sides of her Lauren that are often anything but ‘adult’ in nature. Lauren is warned by three “Lum Elders” (Actors 1, 2 and 3 taking on quirky characters right off the streets of Chinatown) that she only has until sundown to find her father. To do so, she must obtain Chinatown’s “strongest whiskey,” “sweetest orange,” and “loudest firecracker.” Layer by layer, Ms. Piamonte’s Lauren loses all inhibitions as she buys the whiskey without having any money, line dances with a lion for his hidden orange, and solves a riddle under the threat of losing her own face to the Sichuan Face Changer (a remarkable character’s whose multi-colored countenances magically switch before our eyes -- all part of the incredibly creative, riotously designed costumes of Sarah Nietfeld). 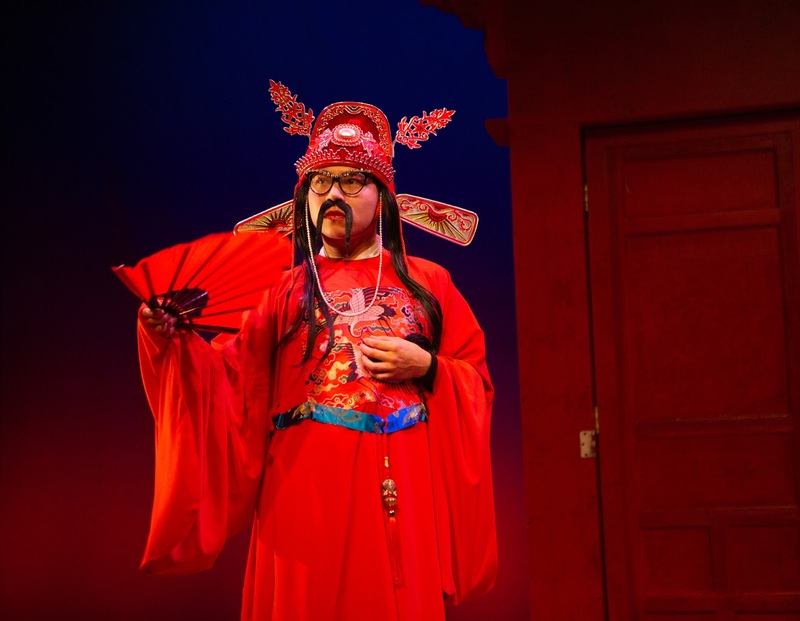 She even meets a high-heeled, gender-fluid version of the “model ancestor” (Will Dao), clearly proving this is an “only in San Francisco” kind of story. Director Joshua Kahan Brody pulls out all the stops to create a play that sometimes runs in fast-forward, cartoonish speeds and other times, in laughter-producing slow motion. At all times, the pace never pauses too long in any one place, with surprises around every corner. Mikhail Fiksel’s sound design plays major roles in both the mystery and the hilarity of the evening (doors that pound ominously from within, explosions that occur whenever a certain name is said) while the lighting of Wen-Ling Liao completes effects set up by the Mr. Fiksel’s sound design as well as brings the audience into the show, establishes back alley atmospheres, and helps guide Lauren on her chase to beat sundown’s demise of her dad. King of the Yees continues through March 2, 2019 at San Francisco Playhouse, 450 Post Street. Tickets are available at http://sfplayhouse.org/ or by calling the box office at 415-677-9596. 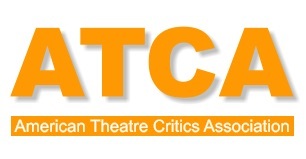 I saw this show last night and loved it! It wholeheartedly deserves its 5 E's .